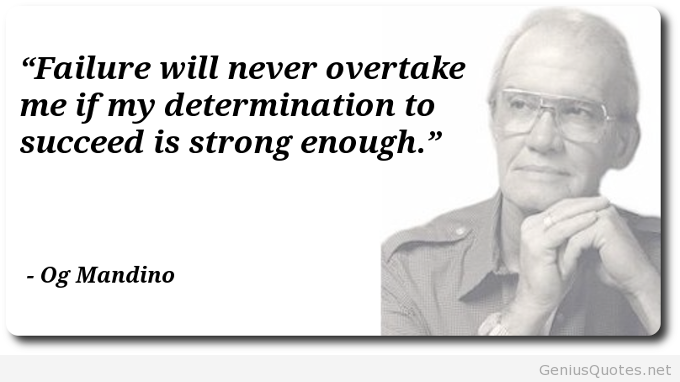 Writing the book is the easy part. For a period during the 90s, my parents embraced the power of positive thinking (see above), and they received much of that messaging via audiobooks on cassette tape that they’d play in the car while we drove around town on their weekend errands. I am not exactly the world’s most positive thinker – I am a worrier, and always imagining worst-case scenarios, most of which never occur (but YOU NEVER KNOW so there’s no reason to ever stop this pattern of behaviour). There’s a perverse satisfaction in imagining you’re on the verge of some spectacular failure and then having everything work out fine – you always sort of feel like you’ve avoided catastrophe, or like maybe your luck is changing. Positive thinking may not be as powerful as some motivational speaker – or my parents in 1994 – would have you believe, but somewhere deep in the dusty back corners of my hippocampus, I know that I can manifest strange scenarios based on my particular worry of the day. Positive thinking is fine, but the true power is in the brain’s ability to retain and mutate an idea over decades. If you can believe it, you can achieve it! Kind of. I work at the University of British Columbia, and I have been there, more or less, since 2004 when I started taking classes in the Creative Writing department. I started working at the university in 2008, and have been a regular customer of the campus bookstore for much of that time. They feature a lot of local authors, and there is often a shelf for books by staff and faculty. 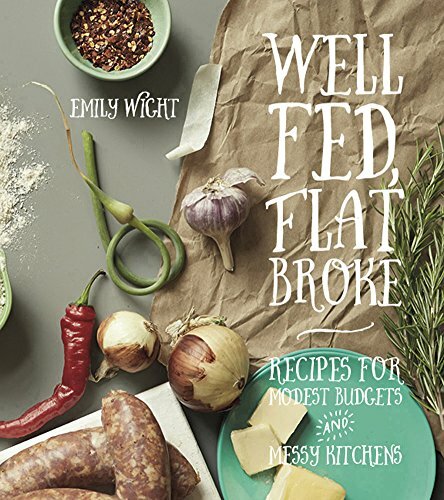 When Well Fed, Flat Broke: Recipes for Modest Budgets and Messy Kitchens came out in 2015, my very first thought was “I wonder if UBC Bookstore has it, and more importantly where they have put it.” I don’t know what I was imagining, because I wrote a cookbook and not, say, a book of short stories or a history of Canada, but I thought it might be on display somewhere people might see it. So I went to the bookstore on my lunch break. I worried that maybe no one would buy the book, but I wasn’t worried about anyone recognizing me because who knows what any author looks like unless they are famous and I’m not. In an unusual turn of events, my worries were misplaced. I wandered to the back of the store where the cookbooks were shelved. It wasn’t there either, but it was a new book and maybe they didn’t have it yet. I accepted this, because though I am a worrier I am also mostly rational once I think about things for a minute. Everything would be fine. I would check back in a week. Maybe they’d devote a small area of the front to displaying it. You know. Maybe. I cut through the nonfiction section on my way back to the front of the store where the new releases were – I don’t generally leave bookstores empty-handed. 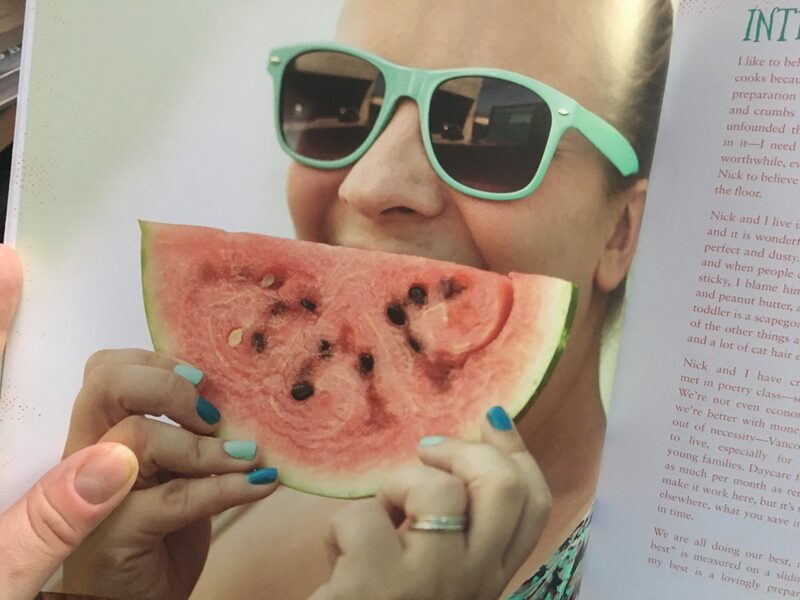 I walked past two women with a cart full of books to be shelved, and they were chatting and I had no plan to interrupt, except that at the exact moment that I walked past, I caught a glimpse of my dumb face leering up with a terrifying watermelon grin from the cart, and then I died. They saw me, and they saw me pause for the millisecond it took for my death to occur. “Is this YOU? !” one of them ask-exclaimed. “HAHA OH MY GOD,” I remember saying. “I AM NOT LURKING IN THIS BOOKSTORE HOPING TO BE NOTICED!” I think I yelled. I think they said something reassuring, like “no one thinks that” or “wow you are turning so red” but I can’t be sure because I, an adult woman in her thirties, dressed in drab business-casual clothing as if to suggest a level of professionalism and maturity, turned and ran away. For clarity, I did not walk briskly, it was a full run which is unusual because I don’t like to run and I know I don’t look graceful doing it. I stumbled out of there and ran back to the building where I work and pretended that I was a normal, functional human being for the rest of the day, even though every 30 minutes I had to pause for a nervous shuffle to the washroom to relive and/or purge my shame. I wish I could tell you I learned something tangible from that experience, but here we are in 2017 and I’m still lurking in bookstores. 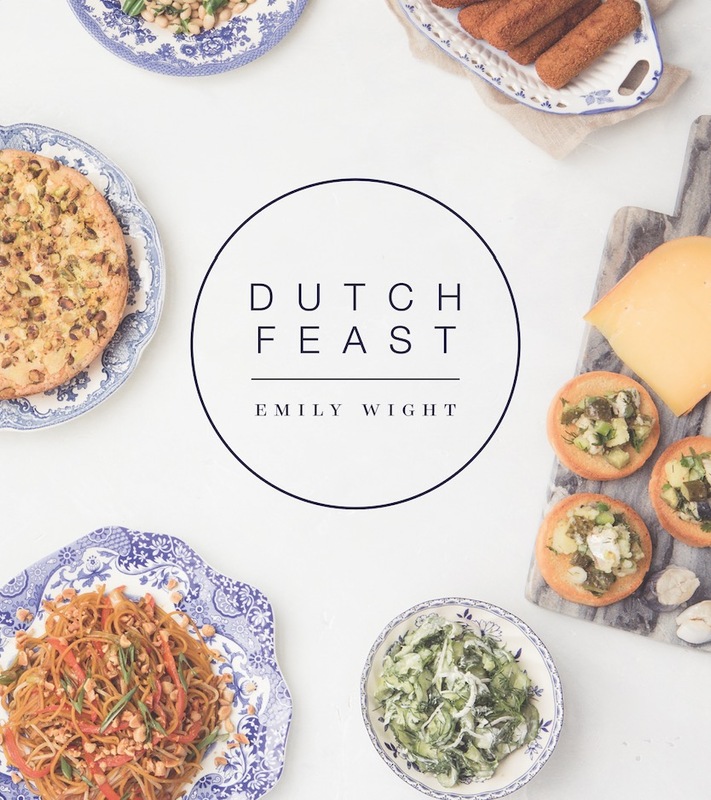 Dutch Feast is now out there in the world, and I’ll be visiting Winnipeg and Toronto to launch it into the Canadian market (we launched in Vancouver on November 7), and I don’t know how it’s going to go but I’m trying not to imagine scenarios that involve me sprinting away from the scene. With that in mind, I’d love if you’d come say hello! I’ll be in Winnipeg on the evening of November 27, reading a bit and hopefully sharing some Dutch sweets at McNally Robinson Books. And if you’ve ever wondered about writing a book, just know that getting the words down is the easy part. < Previous Let’s talk about Snacks (and a giveaway). Next > Roasted pumpkin soup. Congrats on your cookbooks! I think this is one of the funniest tales of impromptu cardio I have ever read! Good luck with your new book and enjoy Winnipeg. You’ll find it a shock after Vancouver weather but it is only temporary. B) I would run too. What a great read! Just read about your book in the Montreal Gazette and decided to follow it back to your blog. Looks like it is worthwhile exploring! I am so glad to hear that! Thank you!! !